In 1996, I didn’t know I was gay. But I knew something was up. That year, The Simpsons aired the episode “Homer the Smithers,” in which Homer must fill in as Mr. Burns’ assistant while Mr. Smithers is on vacation. 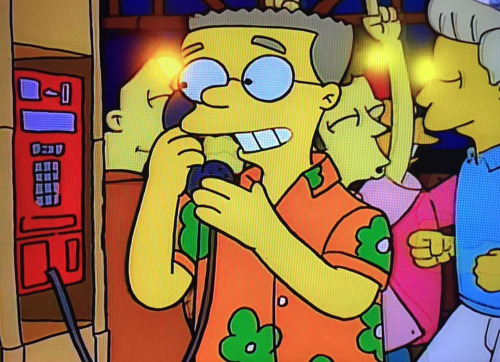 Whenever Smithers calls in to check on the situation, you see a quick peek at where he’s spending his away time, and in one scene in particular, Smithers mentions that “picture-taking isn’t allowed at this particular resort.” He’s in a dance club, and he hangs up the phone because there’s a line forming behind him. It’s a conga line. And it’s all dudes. Being twelve years old and generally clueless about the world, I didn’t know what to make of this scene. I can remember asking my mom what kind of vacation place wouldn’t allow photography, and she had no idea. I didn’t mention the conga line of men, because despite not having an inkling about myself, I felt like that wasn’t something I should be expressing curiosity about. 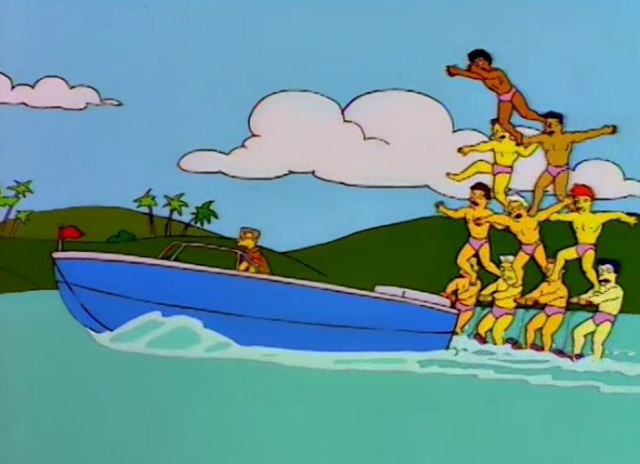 I also didn’t mention a later scene in which Smithers is towing a pyramid of male waterskiers, all of whom are wearing pink speedos. I suppose I’m writing this for two reasons. First, when I did realize a few years later, I still didn’t know much about the world. This episode informed my idea of what gay men were like, at least to an extent, and I guess I figured one day I would be going to some weird beach resort where photography wasn’t allowed. I haven’t done that, at least not yet, and I don’t know when I learned that these types of vacations weren’t a requirement of being gay. (Going to Fire Island apparently is a requirement, but social media tells me that this trips are throughly documented with photos. In any case, Palm Springs is closer to Los Angeles.) When you don’t have access to information about what gay people actually do and when you sure as hell don’t talk to anyone about it, it’s strange how this little scraps of representation end up becoming all you have. Watching this episode twenty years later—it just aired on Sunday as part of the FXX Thanksgiving marathon—I also realize that I never thought I would have gotten to the point I’m at now. I’m gay. Anyone who matters knows. And all that happened well before it happened for Smithers. Before high school, he was the only gay character I knew well, and at some point I guess I figured I’d end up like him: quietly and inconspicuously gay, never being outright with it, and somehow living a smaller life as a result. That didn’t happen. 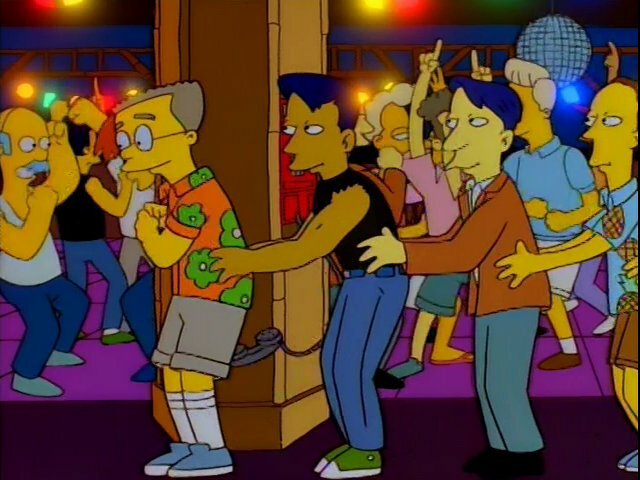 I didn’t ever think about it terms of me outpacing Smithers until now, but I’m glad it happened. The other point is a harder one to put into words, but it has something to do with being a kid who’d grow up to be gay, not being consciously aware of those feelings and yet somehow going through life seeing things and occasionally saying “Oh, that.” I’m not sure what I thought my brain was doing, but it’s weird to be paying attention to something without understanding what the draw is, if that makes sense. It wasn’t always so obvious, either—although it certainly does explain childhood obsessions with princesses but also with barbarians—and sometimes I think I’d perceive something as being gay-coded without actually understanding what all that meant. 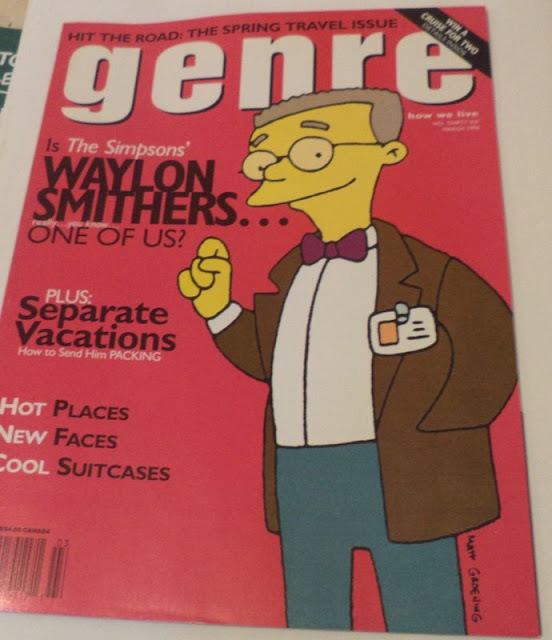 Before the “Homer the Smithers” episode aired, I can remember being in a bookstore and seeing a magazine that had Waylon Smithers on the cover. It happened to be Genre, which I’d later learn was an LGBT publication. I didn’t know that at the time, but the cover read something like “Is Waylon Smithers one of us?” on a bright pink background. This happened at a point in my life where I’d buy anything with a Simpsons character on it, but something told me that no, I shouldn’t ask to buy this particular magazine. I’ve no idea what chain of decisions led me to skip it—not even pick it off the shelf, if I remember correctly—but now I wish I had a copy. I’d frame it. EDIT: Here, I found the cover in question. 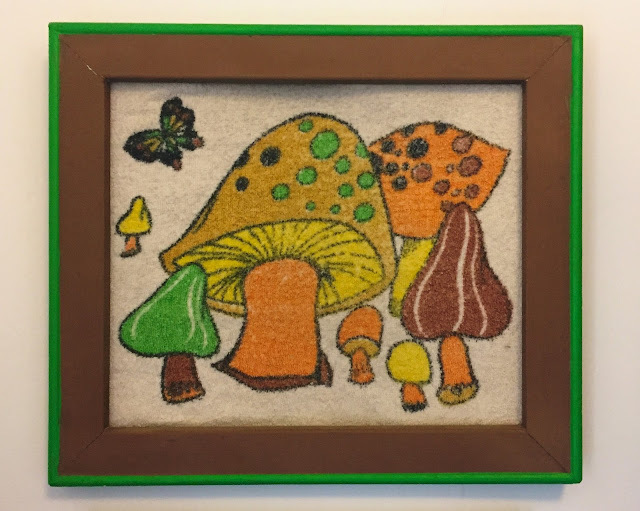 Looks like the auction is over, however.